It's far too easy to slip into hibernation mode during the colder months in regards to all aspects of life. Slightly carb heavier meals, fewer trips to the gym in favour of an extra hour in bed... I'm sure you're all a bit too familiar with this sort of situation. An area I know I'm certainly guilty of, and there's a good chance you are too, is the lack of care I take in my body. I have a tendency to be a little neglectful of my bodycare routine throughout the year anyway, but in particular during colder months. The moment I step out of the shower, I just want to dry off as quickly as possible and get into some snuggly clothes. The last thing I would want to do is stand there, shivering whilst I apply equally cooling products simply in a bid for a softer body. I'm not suggesting doing this every night if this really isn't your thing, but I've got four truly awesome products that promise to pamper your body in no time whatsoever, won't break the bank either, and are perfect for anyone who's a little lazy when it comes to their bodycare routine. If I can do it, you most certainly can too! I've mentioned before that I don't really see much point in spending a fortune on shower gel if you're simply going to wash it off, but The White Company's Seychelles Bath & Shower Gel was a Christmas present from last year that I am totally obsessed with. The uplifting, gentle scent of bergamot, amber and vanilla will trick you into thinking you're on a luscious white, sandy beach, instead of shivering under the shower in Mid-November. If your body needs a little TLC, it's worth cracking out something a little more luxurious to get you into the mood. Sanctuary's 4 Day Moisture Oil Scrub is no stranger to SSL, as it's something I proudly mentioned in the summer months. It's a worthy contender here as it's simply a brilliant all-year-round product that leaves you with the softest skin imaginable. This super fine salt scrub is infused in hydrating oils, meaning once it's worked into the skin, when rinsed off it leaves ridiculously soft and supple skin. Use before shaving your legs for a cleaner shave, or use once or twice a week to ensure your skin feels nourished instead of dry and flakey. A big ol' tub will last you forever and the classic Sanctuary scent will also increase the luxurious experience. These next two products are relatively new to my collection but are worthy of their status on the bathroom shelf. The Dove DermaSpa Uplifted Satin Smooth Body Oil* (phew!) is probably the product that my body has been waiting for. It's an incredibly lightweight body oil the the skin drinks up in seconds. So, you can pop out of the shower, dry yourself off, add a quick slick of this and you can slip on your clothes immediately after - no sticky, clammy feeling! The bottle disperses the right amount of product and it really does feel like the sort of product you'd find in a Spa. What's even better is that I tried this in the morning, and the soft and hydrated feel lasted all day and into the next day. Winner, winner. We'd all kill for the glowing skin that Victoria's Secret Models, Rosie Huntington-Whitely et al all seem to naturally have, right? There seems to be a million and one products out there that claim you can achieve that iridescent, highlighted look too but are such a faff to apply, and most of the time don't last very long. Now I can see this being a sell-out throughout the upcoming Christmas party season... I'd like to introduce you to your new best friend, the Dove DermaSpa Goodness Silky Body Oil*. This adds a luminosity to the skin that makes me wish it wasn't so cold that I need to cover up my legs all the time! Apply this to high points of your body, such as the collar bone, shoulders and down the front of your legs for a true Golden Goddess look. So, these four products combined makes the easiest, quickest yet most luxurious way to achieve a gorgeous, glowing, nourished body all year round, and in particular, during Autumn and Winter. Do you get a little lazy when it comes to bodycare during the colder months? 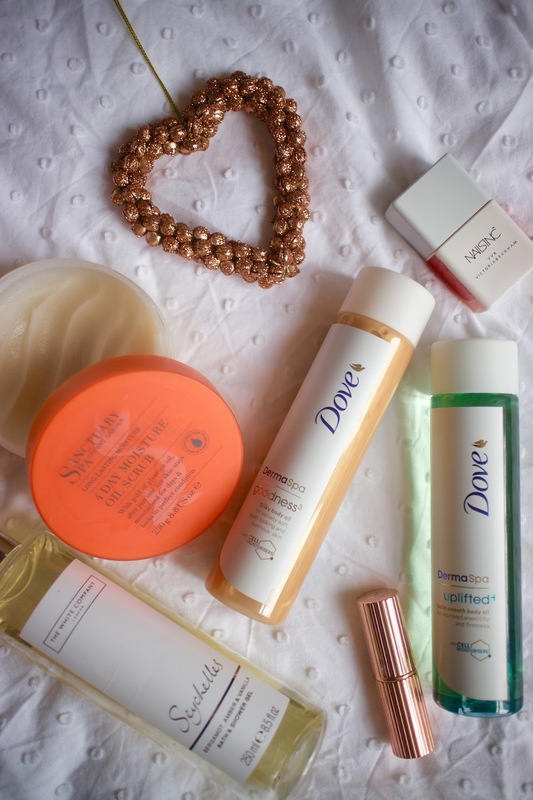 Are there any products you reach for that nourishes your skin in a hurry? Have you tried any of the products mentioned before? *PR Sample. All opinions remain my own. Thank you ever so much to Dove for sending me some samples from their brilliant new DermaSpa range. Please visit the Dove website for more information on the range.